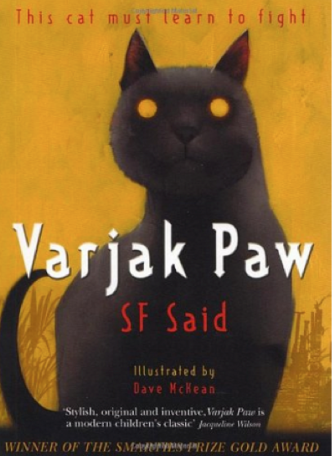 Varjak Paw is an exciting and imaginative adventure story which is great to read aloud and to look at closely with its striking illustrations. Varjak Paw is a pedigree kitten leading a sheltered life with his family. A bit of a misfit, Varjak looks and behaves differently to the rest of the family and is often ridiculed; but one day, when the family are in danger, he is the one who bravely ventures outside to seek help. Varjak soon finds himself in the city and a world of intimidating street cats and mysterious feline disappearances. In his dreams Varjak meets an ancestor Jalal and learns a mystical martial arts for cats called ‘The Way’, which helps him survive life in the city. Eventually with new friends and new skills he is able to help his family and solve the mystery of ‘The Vanishings’. The story explores a number of themes and ideas giving lots to talk about including being different, bullying, friendship, courage and determination. Read what the author says about the story here. How the book made you feel. Were any bits that were especially scary or funny? Share your funniest or scariest moments. Talk about how you think Varjak feels at different points in the story? Talk about the difficulties Varjak has at home in his family and when he is in the city and how he copes with them. Talk about which characters you liked most and why. Make a Varjak mask and one for another character and recreate a scene from the story (eg when Varjak meets Sally Bones) and have imaginary conversations between the characters. Find a space so your child can try recreating the Seven ways of Jalal with their bodies (slow time, moving circles, shadow walking). You could take photos to look at together afterwards. What advice would Varjak give other kittens venturing into the city for the first time? Make a mini book with information about how to recognise a dog, what a car is, street cats to be wary about and pictures of the seven skills of Jalal which could come in handy.